There is a little Korean deli on the first floor of my office building. They have a pretty good selection of standard fare: sandwiches, a hot bar, snacks, drinks, etc. When I fell off the wagon with my eating at the end of last year, it certainly didn’t make things easier by having “bad” in-house options so easily accessible, with one item in particular. I was, and still am, obsessed with their bulgogi sandwich. 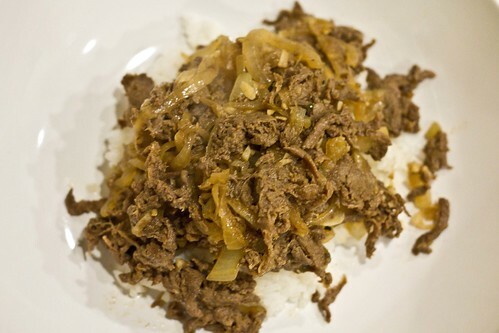 For those of who who are unfamiliar, bulgogi is a Korean dish that generally consists of specially marinated beef, and it is frackin’ delicious. You can usually get it at any Korean BBQ restaurant, and the downstairs deli had the brilliant idea of slapping it in a white roll (also delicious) with cheese (I can’t handle flavor of this magnitude!) and basically single-handedly killed my diet. I think you know where I’m going with this. Naturally, now that I’m trying to clean up my eating again and get back on track, I’m finding myself battling some serious bulgogi cravings! And since the cuts of meat generally used for this dish tend to be very fatty, and the marinade is made with liberal amounts of soy sauce, sesame oil, and sugar, it’s not really something I can justify as a regular menu item. Plus, this particular dish is notorious for using MSG to make it so banging. But instead of resigning myself to a lifetime of bulgogi-less misery, I remembered that I’m a semi-decent cook, and I could create my own, healthier version! By using lean cuts of shaved beef, measuring out specific amounts of the marinade ingredients, and loading this mother up with veggies (well, I just used onions this time around, but I bet peppers would be a great addition too! ), I’ve managed to limit calories without sacrificing flavor! Admittedly, this doesn’t replicated traditional bulgogi exactly, hence the “healthy” qualifier. But the flavor profile is similar, and the guilt is gone. So I’m counting that as a win in my books. It’s not the prettiest dish in the world, but served up over some rice and something green on the side (brussels sprouts in this particular instance, what else?) it still looks pretty good. And it tastes damn delicious, which is the most important thing here, right? Seasoned with traditional ingredients, minus the MSG, this healthified version of the Korean classic is sure to satisfy your taste buds without breaking the calorie bank! Enjoy over steamed brown or white rice, or in lettuce wraps. Feel free to swap out the beef for another protein — this dish would also taste great with pork, chicken, or even tofu! 1. 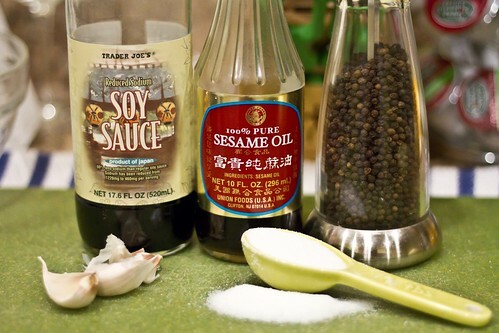 Combine soy sauce, sesame oil, garlic, sugar, and sesame seeds (if using) in a bowl. Add shaved steak and coat thoroughly. You can add a splash of water if for any reason the sugar is not dissolving or if you are not getting enough coverage on the meat. Cover bowl and marinate in the refrigerator at least 20 minutes, up to 2 hours. The longer the better! 2. Spray a large skillet with nonstick spray and heat to medium heat. 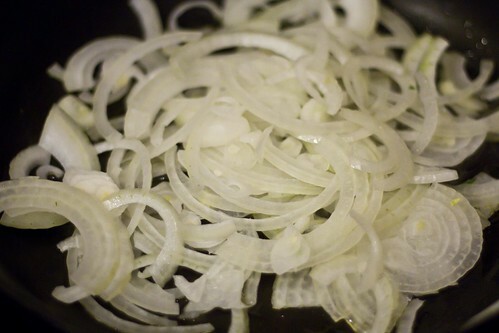 Add sliced onions and cook until they begin to get translucent and soft, about 2 minutes. 3. 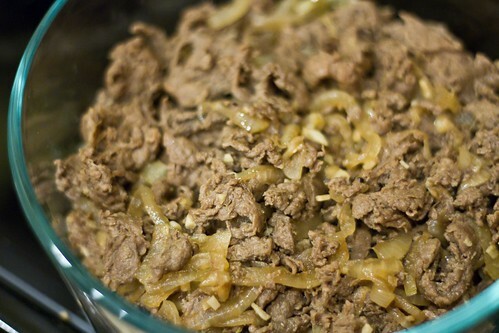 Add marinated beef, and cook until meat is no longer pink, about 5 – 7 minutes. Serve over rice and enjoy! Nutritional info per ¼ serving: 256 calories, 14 g fat, 8 g carbs, 24 g protein. Add 100 additional calories for ½ cup of rice. Ummm, yummmmmmm. I. Love. Korean Food. This is great! Question: did the steak come shaved or did you do it yourself? I got it that way from Trader Joe’s (I think it’s labeled as shaved rib eye steak or something, and is marketed towards steak & cheeses) but I’m sure you can do it yourself too if necessary. Go to the Joe’s for convenience though! I’m not familiar with bulgogi… but you just answered a question for me! There’s a restaurant in Frederick that is similar to Chipotle (in that you order and go down a line to add toppings) called Gogi-bop (or pop?) that I’ve never been to, but it’s on my list. I’ve been wondering “what the heck does that name mean?” but now it makes sense! I’m a big fan of any type of protein that is grilled with onions!! Oooh, a fast-casual Korean BBQ place?! Now THAT sounds like something I need to try. PS: I keep hearing amazing things about Firestone’s and The Tasting Room from someone I work with. I think I need to take a trip up to Frederick soon! You let me know if you’re coming to Frederick! Hey now, my family has never used msg for bulgogi and I’d hardly consider it a “traditional” ingredient 😉 Actually, if you ever want to go the marinating route my mom often cuts the sugar or eliminates it by using fresh pineapple or other fruit (like Asian pear) to sweeten the marinade. Funny story, do you remember kyoto the Japanese restaurant in Harrisonburg? They definitely made their “reduced” sodium soy sauce by watering down regular soy sauce……. Hey Gretchen – how are you making your brussels sprouts these days? I was trying to direct another blogger to your site yesterday, because she was looking for a good way to make them. I thought I remembered you posting how you make them, but then I couldn’t find it. Cut stems off of sprouts and slice them in half. Toss in olive oil, salt, pepper, and a sprinkle of sugar or maple syrup — coat evenly. Roast in the oven for 10 – 15 minutes, depending on how big the sprouts are. They should be totally soft and maybe even a little bit caramelized when they’re done. Thanks Suzanne for sharing your mom’s recipe. This sounds absolutely delish! Think I will be hitting up TJs this weekend!! This looks great!! I can’t wait to try this. Bulgogi is one of my favorites but I avoid it because of the calories. Now, wait a second! Bulgogi sandwich? With cheese?! I have to tell my husband about that thing ASAP! I personally prefer bulgogi tofu, of course. We regularly make bulgogi (tofu for me, meat for the others) on our little teppanyaki griddle. The last time was on Christmas Eve. We like to make salad wraps with bulgogi meat (or tofu), rice, kimchi, hot sauce, and various banchan. That’s called Sangchu ssam. Our marinade recipe is quite similar to yours, but we often use honey instead of sugar, and add a splash of lemon juice or vinegar. I just went there for the first time a couple of weeks ago! So much fun! yuummm looks delicious!! how did you figure out the nutritional info for it?? my mouth is watering! literally! i’m buying that steak at trader joe’s on my next trip and totally making this. 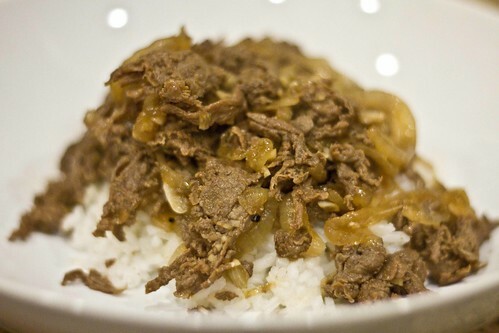 Bulgogi was one of my favorite Korean dishes. My instructor said her mother’s secret ingredient was a bit of pepsi to add the sweet with the salt. Her’s always tasted fantastic. One thing I really miss about being a vegetarian. 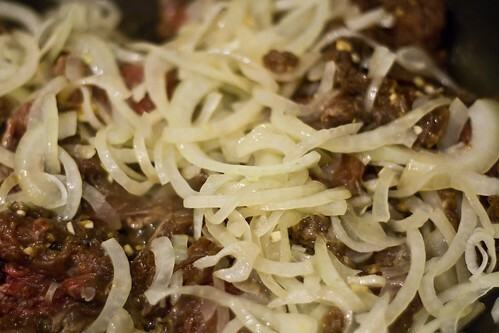 Bulgogi is one of the first Korean foods I was introduced to by my Korean roommate. 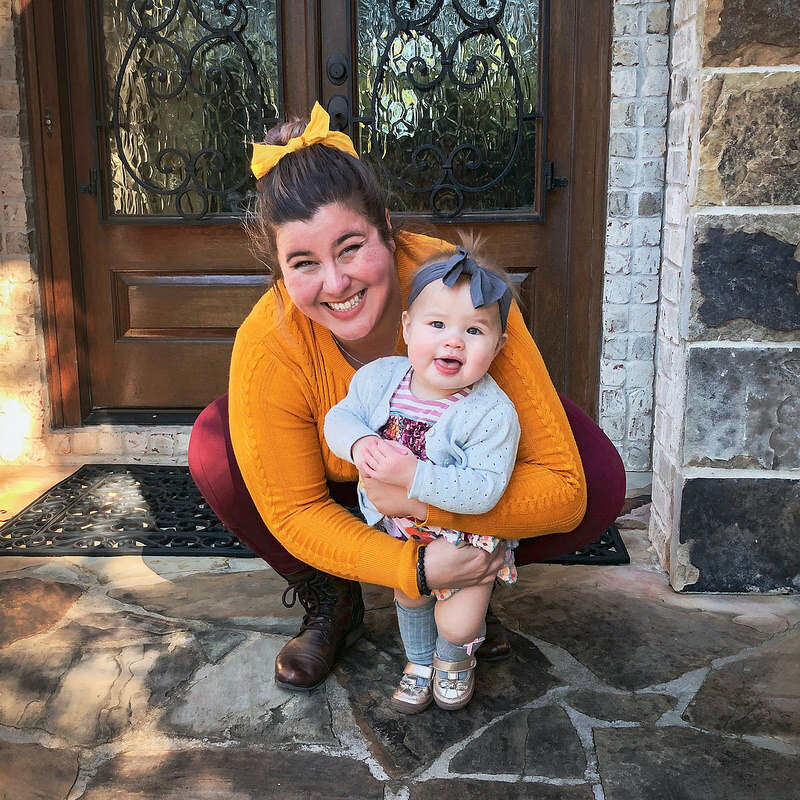 When her parents came to visit, her mom made the sauce from scratch and it was so good! I will have to give this a try since I don’t live near any Korean restaurants or markets to get bulgogi. Wow! I found this recipe yesterday while looking for something to make with Trader Joe’s shaved beef (my new favorite product). I made the bulgogi last night and it was a smash success. My husband said at least five times that it was great. So definitely adding it to the rotation. Thanks for an easy and fantastic recipe!